Gleim vs Roger CPA Review - 100+ hrs Research & Analysis! Which is the Right CPA Review Course for You? 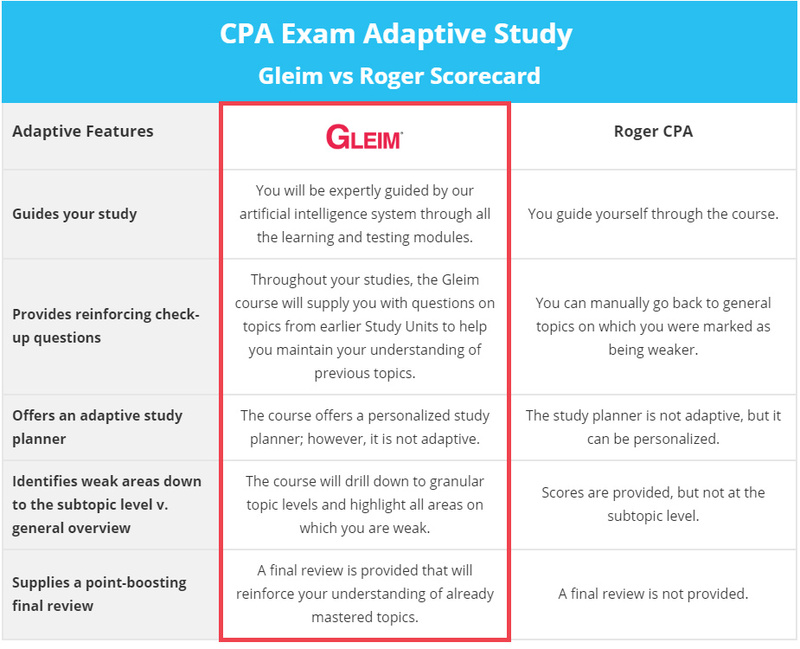 See our breakdown of Gleim vs Roger CPA Review in an analysis of two of the most popular CPA Exam prep providers on the market today. Learn how we distilled the marketing hype into facts after over 100 hours of research and verification. You can use the Gleim vs Roger CPA Review scorecard to perform your own analysis, too. Choosing the best CPA review course can be daunting. You’ve probably noticed that many folks praise Gleim while others stand by Roger CPA Review—and both sound convincing! You may also have realized that some websites make money by recommending the providers that pay the biggest commission. Gleim’s passion lies in helping candidates pass the CPA Exam. So it’s only natural that we want to equip you to choose the CPA Exam prep materials that will serve YOU best. Which course has the strongest foundational features? What other features appeal to you, and why? What’s the value for the price? Let’s look at Gleim vs Roger CPA Review in more detail, beginning with the highlights. 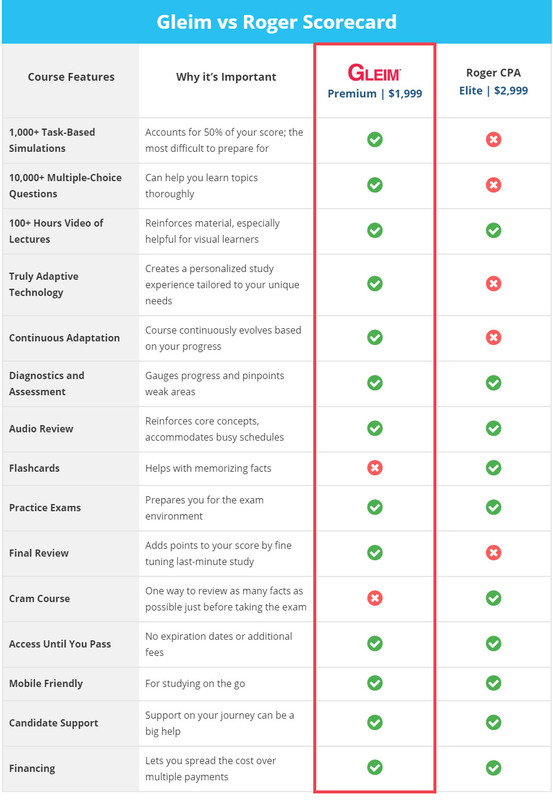 You can also see our detailed analysis comparing major CPA course providers in this comparison chart. Dr. Gleim created the self-study CPA Exam Review industry over 40 years ago. As an accounting professor, he saw what his students needed to pass the CPA Exam. This passion to help future accountants continues to guide us. Let’s walk through the research. Generally, providers update CPA exam prep materials every year. We made sure our researchers were looking at the latest versions of both Gleim and Roger CPA Review courses. Many CPA review providers offer products at different price points. To keep it fair, we compared the premium systems—the ones you are most likely to consider when you’re serious about passing the CPA Exam. In this case, we compared Premium Gleim CPA Exam Review materials to the Roger Elite package. First, we carefully read through Roger CPA Review marketing materials to understand and document claims. Then, we had a second party actually use the Roger CPA Review course. We updated our research to make sure we reflected the facts. Next, we handed our research off to another quality control team to verify it all. Finally came the task of pulling it all together in a way that would be meaningful to you. Our aim was to present a balanced analysis to help you weigh the options yourself. We identified 16 basic categories of features you’ll find in many CPA review courses. Keep in mind some are more important than others. Which features are important when choosing a CPA review course? Some features are more important than others when it comes to passing the CPA Exam. This is important to know as you compare course providers. We have studied which elements in a course are the most critical to passing the CPA Exam for over 40 years. We have found that, without a doubt, your practice questions and their answer explanations are the most critical variables in your CPA Exam success. Add to that strong course content, truly adaptive technology, and great coaching and support—and you have the optimal foundation for passing the CPA Exam. Below we dig a little more into these features and why they are important. We also include notes on how these particular features play out in our analysis of Gleim vs Roger CPA Review. Test banks should include two types of CPA Exam practice questions: task-based simulations (TBSs) and multiple-choice questions (MCQs). The sheer number of questions in a test bank is important—as long as the questions are high quality. The CPA Exam can test on 229 topics that break down into roughly 600 representative tasks. No one knows what the actual questions will be—so you have to know them all. The more practice you can get, the better. If you have fewer practice questions, you will miss opportunities to learn material as thoroughly as you should. With large test banks, confirm that the provider hasn’t simply repeated questions and changed out the number; each question should teach you something new. Answer explanations can be a very powerful learning tool because they enable you to learn from your mistakes. These are the principles behind the test bank in the Gleim CPA Review. Many CPAs will tell you this was a major factor in their success. Only perfect practice makes perfect. Practicing with questions that are as difficult as those on the actual test is important. Be sure to consider which review providers offer you the challenge you need in their test banks. The questions and simulations in the [Gleim] review system seemed more challenging to me than the actual exams. I greatly appreciated that fact come exam day, as I felt well-prepared. I felt the Gleim simulations were especially excellent preparation for the real exams. Gleim: 1,300+ vs Roger CPA Review: ? Task-based simulations (TBSs) test your ability to apply knowledge and judgment in practical situations. They are one of the most difficult aspects of the CPA Exam to prepare for. And they are growing more and more important. Recently the Exam has moved toward including more task-based simulations. They now make up 50% of your score on all Exam sections except BEC. We counted 309 TBSs in the Roger CPA review course, though it does not specify a number publicly on its website. Gleim clocks in with 1,300 detailed simulations, more than four times Roger. Gleim also leads the industry with over 340 sims with exhibits and more than 75 document-review simulation questions. Gleim: 10,000+ vs Roger CPA Review: ? Gleim has the most comprehensive test bank of MCQs in the CPA Exam prep industry. We prepare each question with the goal to test—and teach—a new concept. Thousands of those are questions released by AICPA. Our answer explanations are thorough. They are a powerful way to learn concepts and reinforce understanding. We couldn’t find a number specified in Roger materials but our verification team counted 5,006 MCQs at time of publishing, barely half of the Gleim MCQ test bank. Gleim includes more AICPA-released questions than Roger has total MCQs. In addition, users will tell you they find Gleim’s practice questions more challenging than Roger’s. Video lectures give you one more way to absorb and reinforce key study material. If you’re a visual learner, this may be especially important to you. Gleim and Roger CPA Review offer roughly the same number of hours of video lectures. It’s worth noting that Roger is known for entertaining lectures, which can be very helpful for visual learners. The most recent version of Gleim is trending toward more dynamic video lectures, too. Almost every CPA review course includes practice exams. However, not all look and function the same as those you’ll have on test day. Taking practice exams gives you confidence that you know the material. They can also help you get familiar with the test format and functionality. Gleim makes sure its practice test interface looks and works just like the one you’ll see at Prometric when you sit for the real CPA Exam. We’ve heard from many CPA candidates that they appreciated getting used to the calculator and timer in our Practice Exams, for example, because they were just like those they had to use on test day. Roger attempts to make its practice exam feel realistic with its CPA Exam Simulator. However, it excludes some features like the introductory section and Excel, and their calculator is different—seemingly small things that can actually make a big difference on test day. The Gleim review system has effectively helped me to check where I am (my strengths vs my weaknesses) and to figure out what I need to do in order to fix my weaknesses. I can tell you with absolute confidence that Gleim worked best for me. This may come as a surprise, but some CPA review course providers enforce limited-time access to their products. If this time expires, you need to pay more to regain access. No one goes into the CPA Exam expecting to fail, but the low pass rates show that many still do. With Access Until You Pass® from Gleim, you can continue to use the materials as long as you need to. Roger CPA Review also offers a version of this guarantee. Both providers include free updates to the study materials during the time you are using the review course. Self-study can be isolating. A great CPA review system will include support to help you get to the finish line. This can include phone, live chat, and email support to help keep you motivated, answer subject matter questions, and assist with any tech support questions related to the course. Personal Counselors help you set a study plan; keep you on track; and guide you through registration, exam preparation, and score release. Accounting experts help you with questions regarding the material and continually update material to ensure it is always clear, concise, and accurate. Technical support staff offer assistance with course set up and troubleshoot any errors you encounter during your CPA Exam study time. Roger CPA Review includes general customer support along with a homework help center. They do not assign a counselor to help you. …I also like that that they [Gleim] assign a personal counselor to you to check in periodically. I felt that this helped me to be accountable and that I was not pursuing this alone. CPA Exam prep course prices don’t make much sense. The Gleim CPA Review Course provides the greatest value given the high-quality features offered for its price. Some other providers charge a higher price but offer discounts continually. And the highest priced option, Becker, only offers 18 months of access, requiring additional fees if you need more time. Gleim offers its CPA Exam study materials at an affordable price purely because we believe in making CPA review materials accessible to all. That has been a guiding principle from our beginning more than four decades go. Gleim offers incredible value for the budget-conscious. Roger CPA Review costs 50% more. A truly adaptive system results in a unique, personalized study experience, like having a personal tutor. It serves you the content you need to learn according to your progress with the material. Adaptive technology in the Gleim CPA Review, called SmartAdapt™, guides you to the material you need to improve your weak areas. It takes out the guesswork and efficiently drills down to the topics you need to practice, resulting in a course that’s tailored precisely to you. In fact, Gleim feels that personalization is such an important component for success that the company invested in building its own technology completely customized to the unique challenges you’ll face while studying for the CPA Exam. Roger CPA Review announced in 2018 its new predictive data platform. This technology compares your progress to past Roger users. It lets you know how you fare relative to successful candidates’ score averages when you take a quiz. However, the Roger CPA review does NOT continually adapt with each question as you study. It shows a path based on others’ progress rather than adapting to YOUR unique needs. Using the system just the way it is prescribed I ended up averaging an 87 across all four parts on the CPA exam, passing all on the first attempt. Guides your study You will be expertly guided by our artificial intelligence system through all the learning and testing modules. You guide yourself through the course. Provides reinforcing check-up questions Throughout your studies, the Gleim course will supply you with questions on topics from earlier Study Units to help you maintain your understanding of previous topics. You can manually go back to general topics on which you were marked as being weaker. Offers an adaptive study planner The course offers a personalized study planner; however, it is not adaptive. The study planner is not adaptive, but it can be personalized. Identifies weak areas down to the subtopic level v. general overview The course will drill down to granular topic levels and highlight all areas on which you are weak. Scores are provided, but not at the subtopic level. Supplies a point-boosting final review A final review is provided that will reinforce your understanding of already mastered topics. A final review is not provided. See adaptive learning technology compared across all the top CPA Review course providers. In our scorecard of CPA course features, Gleim scores 14 to Roger’s 11 out of 16 CPA course features. As you consider which CPA Exam prep course is the best fit for you, first identify the features that will set you up for success. Only you know your study style and needs. Use the list above to compare foundational features across providers and consider any additional must-haves. Then finally look at the value—are you getting what you expect for the price?